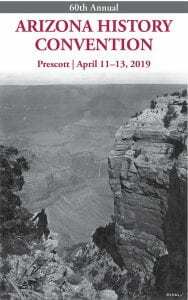 Join amateur and professional historians in exploring Arizona’s rich and colorful past during three days of papers, talks, workshops, discussions, book displays, and field trips. Established in 1960, the Arizona History Convention offers a congenial venue for historical researchers to share their results of their labors with one another and the general public. Join us April 11-13 in beautiful Prescott, Arizona! Experience lectures, workshops, panels, field trips, the Arizona Justice Forum, and more! Anyone interested in Arizona history is invited to attend. Read more about the featured sessions at this year’s convention by clicking on the program. Learn more and register online at http://arizonahistory.org/. The Arizona Historical Society’s Publications Director is the executive director of the Arizona History Convention.